Ashley Olsen spent time in LA with her sister Elizabeth, and the two stepped out for a casual afternoon in the sun. 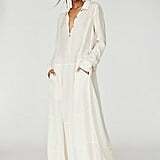 While Elizabeth kept things super low-key in a flannel and jogging pants, Ashley opted for her typical uniform of a long bohemian dress and a cardigan hung loosely over the shoulders. Ashley toted a luxe crocodile duffel and wore simple slides, a gold pendant, and dark wayfarer sunglasses. 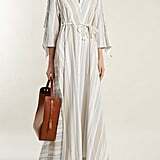 We were instantly inspired by her easygoing, coffee-colored maxi, which featured a touch of lace at the neckline. Sure, it might not be the first must have to pop into your head when you think Fall, but add on a few layers and turn up the weekend vibes and this look flies any day of the week. Read on for another glimpse, then shop some similar pieces we found.